Anker’s PowerCore line has long been a top-rated brand of USB battery packs, and you can save a few bucks on the newest model, while supplies last. 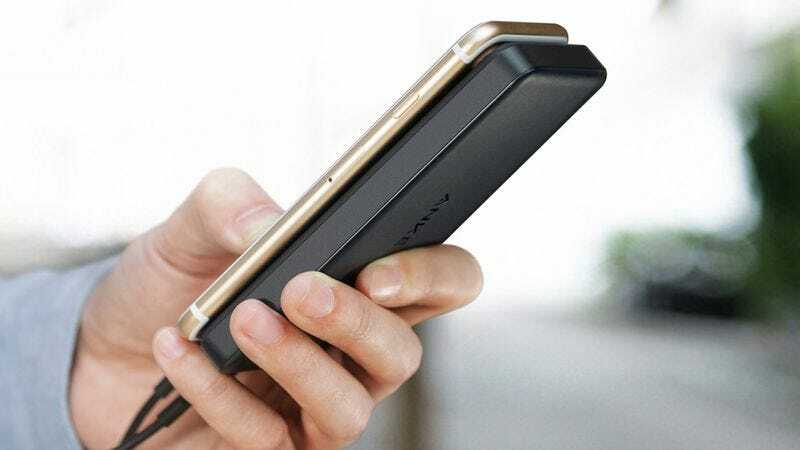 The PowerCore II Slim appears to be the first PowerCore battery pack to include Anker’s new chipset, which delivers the fastest possible charging speeds to every USB device you own, including Quick Charge 3.0. That said, you’ll notice it’s not actually a Qualcomm-certified Quick Charge 3.0 product; it just replicates the tech on Anker’s own chip. That means less internal circuitry, and more room for battery, resulting in one of the thinnest 10,000-mAh battery packs ever made. Very few Bluetooth speakers can run for 30 hours on a charge, never mind ones that cost $33. This model is also splash-proof, and features dual 5W drivers, meaning it should be loud enough for most occasions indoors or out. Just be sure to use promo code AUKEYSK3 at checkout to save $12. Obviously, this isn’t the “real thing,” but the consensus among Amazon reviewers is that it’s at least nearly as good, which sounds like a decent compromise considering it’s less than one-third of the price, and comes with a stable cart and folding shelves, both of which you’d need to buy separately with the Egg. Cotton is one of the softest things you can sleep on, but it comes at a price. Amazon is thankfully helping you out there with its sale on 100 percent cotton, 1,000-thread-count sheets from EL&ES Bedding Collections. Grab a queen set for $71 or a king (and California king) for $79, with your choice from seven different colors. While you’re going to want to sleep on these sheets, don’t sleep on this deal because it ends today. Promo code SOUSVIDETIME will take $20 off the original Joule white/stainless steel and the new all-white. The white model is $20 cheaper to begin with, the only difference being the absence of steel accents; performance should be identical.